In John 19:30, Jesus is recorded crying out “It is finished!” as He was crucified on the cross. This statement is one word in the Greek: tetelestai. In the context of the Scriptures, Jesus literally cried out “The price is all paid!” What price? Jesus had finished the work the Father gave Him to do. He gave up His life that we may be saved from our sinful nature and have abundant life with Him. He knew His mission, His calling and His assignment. Without a shadow of a doubt, Jesus knew it was finished once and for all. Jesus is a leader who knows when the job is complete. In many respects, our daily routine dictates whether a job is complete or incomplete. The items left undone have a direct impact on our day, our future and those around us. We may even pride ourselves in completing our checklist for the week. But, like Jesus, our lives and those around us depend on whether our vision and/or assignment is complete. There is an argument to be made that our work is not complete until we reach eternity. But, our goals and vision points should not stay perpetually in “incomplete” status until eternity when the lives of this generation hang in the balance. It’s hard to confess that the lack of discipline and forward thinking has left many visionless. I concluded with humility that I am under construction. The destination is clear but the roads need to be paved, the lines need to be painted, and the potholes need to be filled. And you may be in the same place. Sometimes we may be driving too fast to realize that God wants to “pave our roads”. Admittedly, I don’t even like being in the middle of construction, especially during rush hour traffic. “Shouldn’t this be done already?” or “Why would they do this work now?” have come out of my mouth from time to time. In order for a highway or building to have a strong foundation, it takes time. You cannot rush the process of quality. 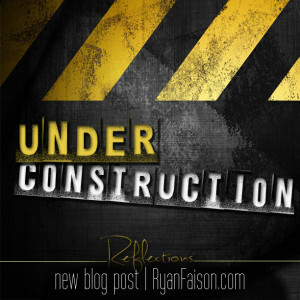 Rushing the construction God is doing in your life is bypassing critical work in your character. The temptation to reach your destination quickly is strong, especially in our culture of “get quick” methods. But, like an expert engineer, God’s construction in your life considers every possible contingency or issue that may arise. When tough times come, you can rest assured that your foundation is strong enough to not only endure but overcome! I pray that you embrace the “under construction” label. Don’t begrudge it or dismiss it. Watch God make all things new in and through you!